It's dangerous business to call the ruler of a country a fool. It would cost you your life in ancient times. But here's a case where the king himself acknowledges his own folly. In a single autobiographical statement, King Saul admitted his error. Even leaders can crash and burn. Pastor Skip looked closely at the career of a king who ended very differently than he began, identifying what went wrong. Jesus warned against calling a person a fool (see Matthew 5:22), but it's different when a person admits they are a fool. Saul said, "I have sinned.... I have played the fool and erred exceedingly" (1 Samuel 26:21). Saul's comment may be an excited utterance (a legal term for an instance when someone admits a true feeling under pressure). Saul had everything he needed to succeed: a notable family (from the tribe of Benjamin), physique (he was tall and handsome), and focus (he was able to concentrate on the task at hand). Saul had God's power---a promise from God for strength. Saul had God's presence--- "God is with you" (1 Samuel 10:7). Saul had God's people---he commanded the nation of Israel and "valiant men...whose hearts God had touched" (1 Samuel 10:26). Probe: Take a moment to discuss your gifts (both natural and supernatural) with your Connect Group. How are you using them for Christ? Saul blew his own horn, saying, "Look what I did!" The greater he grew outwardly, the more he declined inwardly. Later, he acted as a priest---a function reserved for Levites, and he was chastised by Samuel. He even built a monument to himself. Arrogance is a disease that makes everyone sick except the person who has it. Saul made an irrational decision on the battlefield, forbidding his soldiers to eat and showing indifference to their needs in the heat of battle. Later, Saul made a rash decision to kill his son Jonathan, but the people prevented him. Saul could have inspired his people, but he intimidated them instead. He was oblivious to the needs of those around him. Disobedience is the fruit of pride. Saul disobeyed God, using spiritual talk to get what he wanted. But Samuel silenced Saul, telling him that God would relieve him of the kingdom. In chapter 17, David defeated Goliath, which launched his reputation. Celebrating the battle, the women sang a song that Saul was sure was for him. But they praised Saul for killing thousands and David for killing ten thousands. Saul wanted the preeminence---to be first---and he became envious of David. He pursued David and tried to kill him. Jealously ripens into irrational behavior. Probe: Discuss how you have been tripped up by any of these characteristics in the past: arrogance, indifference, disobedience, or preeminence. How did you overcome the problem by God's power? Saul should have lived his life before God. He talked the talk, but didn't walk the walk. God didn't truly rule his life. Saul didn't practice the conscious awareness of the presence of God---the fear of the Lord. Saul should have learned from his past. On two different occasions, he said, "I have sinned," but he didn't do anything to change his thoughts or behavior. Saul should have leaned on his friends. He had Samuel, David, and others to lean on, but he didn't. J. Oswald Sanders said, "You can tell the stature of a leader by the quality of his friends." Saul should have looked after his character. He was concerned with his outward reputation but not his inward person. The biggest fool is someone who lives only for this life without preparing for the next. Probe: Take a moment to discuss these four words: live, learn, lean, and look. How can you apply them to your life in relationship to God and others? What area do you struggle with the most? Connect Up: Discuss the importance of using your talents for God. Jesus taught a parable about a man who hid his talents (in those days, a talent was also a measure of money) in the ground (see Matthew 25:14-30). Are you hiding your talents? Or do you use them for the growth of God's kingdom? Connect In: Saul didn't have genuine friendships. Do you lean on fellow Christians in times of need? Or do you try to work out things in your own power? What advantage is there to working together as the body of Christ? Connect Out: If you exude Saul's characteristics (arrogance, indifference, disobedience, and preeminence), how will it affect your witness in the world? How does what you do and say help or hinder your outreach to nonbelievers? One theologian said, "Example is not the main thing in influencing others. It is the only thing." Hello, and welcome to this message from Pastor Skip Heitzig of Calvary Albuquerque. As these teachings are shared worldwide, our prayer is that God uses them to bring more people into his family. If this message encourages you, we'd love to know. Email us at mystory@calvaryabq.org. And if you'd like to support this ministry financially, you can give online securely at calvaryabq.org/give. Calling a king a fool is dangerous business. But as we continue our series, Crash and Burn, we see a case where King Saul himself admitted his own folly. In this message, Playing the Fool, we look at the career of a king who ended very differently than how he began. Now, please turn in your Bible to 1 Samuel as Skip begins. Every year on April 1 is a thing called April Fools' Day. And I don't know if you know how that began, but in the 1500s, 1582, the French decided to change the calendar back to celebrating New Year's on January 1. Yep, up 'til that time, New Year's was the end of March. They celebrated it on the vernal equinox. So they decided, let's make it back to January 1. That'll be the New Year's Day. Through the years, people have been very creative on April Fools' Day, self included, and playing jokes on folks. But some are more famous than others. For example, in 2005, the media announced that NASA discovered water on Mars. And they told people they have even photographs to prove it. So when you would go to NASA's website, they showed a picture of a glass of water on a Mars candy bar. That was their April Fools joke. We've discovered water on Mars. Of course, to call someone a fool is serious business. Jesus warned against that in the Sermon on the Mount. He said, whoever says, "You fool," will be in danger of hellfire. But it's quite another matter when someone refers to himself or herself that way. Such is the case here. We have King Saul. In 1 Samuel 26:21, Saul said-- now, this is his admission to David-- "I have sinned. Return, my son David, for I will harm you no more, because my life was precious in your eyes this day." Listen to this last sentence. "Indeed, I have played the fool and erred exceedingly." Nine words in that final sentence of the verse, nine words that form an autobiographical statement. Words that were said, perhaps, off the cuff, in a moment of truth. I have a friend who is an attorney, told me there's this thing called an excited utterance. That is a statement made in an unusual time, or a stressful situation. For example, look out! We're going to crash! Or I think he's crazy. Those kind of statements that may be made under duress, or under stress, but they betray a person's true impressions. You might want to look at this as King Saul's excited utterance, words he probably wouldn't say otherwise, or admit to anyone. But here, he says, "Indeed, I have played the fool and erred exceedingly." It's a tragic admission. It's a banner statement of anyone who would squander the call of God on that person's life. It's the admission of a person who would have said, I could have been used powerfully by God, but I wasn't. It's the admission of a leader who went wrong, a King who went wrong, a dad who went wrong, a father-in-law who went wrong, a man who went wrong. All of those were Saul. Now, being the first king of Israel, King Saul occupies a lot of the Bible. 23 chapters in this book are devoted to King Saul, his reign, his mistakes-- 23 chapters. One chapter in the next book, 2 Samuel Chapter 1, is devoted to Saul as well. Because so much of it is there about this one man, I'm just going to give you highlights. I'm going to greatly condense this. And we're going to get an overview. Our anchor text is the one we just read, 1 Samuel 26:21. What I want to do with you, though, is kind of go through his life in this crash-and-burn segment. I want to talk about how he began, then what went wrong, then how he should have changed. So we're going to begin where he begins. I'm going to read to you-- You don't need to turn there. I'm going to need you, though, to have ready in your Bibles, 1 Samuel Chapter 13, in just a moment. Let me tell you how he began. He started out so well, because he had such advantages at his disposal, both naturally as well as supernaturally. He had natural advantages afforded any leader. Now, if you have natural advantages for leadership as well as supernatural advantages, it's a winning combo. You could have one or the other, and they're great. But when you have them both together, it's amazing. So what did he have? Well, first of all, he had family. He had a good family. 1 Samuel Chapter 9 tells us he is the son of Kish, a Benjamite, a mighty man or a man of power. So Kish was from a notable family, making Saul from good stock, from a good tribe-- a small tribe, but a very notable tribe-- the tribe of Benjamin, named after the favored son of Jacob, born by Rachel. So mark that in the advantage list. He had family. Also in the natural advantages, he had physique. The guy looked good. He looked royal. This is 1 Samuel 9:2. It describes him as choice, handsome. "There was not a more handsome person than he among all the children of Israel." The girls swooned when he came. It even says that from his shoulders upwards, he was taller than any of the people. Now, in the east, height and beauty were greatly admired. And it was thought, if we can have a king that looks good, makes us look good. This is why Samuel, when looking for the second king and he comes to Jesse's house, before he picks David, he notices Eliab, the eldest. And he notices him because he's tall and he's handsome. And that's why God says, I have rejected him. Man looks at the outward appearance, God looks at the heart. But he noticed the height of his stature. So Saul had that. Saul had family, he had physique, both going for him. He had something else in the natural advantage list-- not only family, not only physique, but focus. He was focused on the right thing. He was not focused on himself. He was focused on the task given to him. Let me tell you the task. His dad lost some donkeys. Solution? I'm going to send Saul out to find the donkeys. And this kid was focused on that task. He was a donkey chaser. And he was happy to be one. He's out finding his dad's donkeys when suddenly, the prophet Samuel comes up to him-- this is all in Chapter 9-- and says, you're the one that all of Israel is looking to as the next king. Listen to Saul's response. "Am I not a Benjamite of the smallest of the tribes of Israel? And my family least of all the families of the tribe of Benjamin?" What does that tell us? It tells us he was humble. He was not focused on himself. He was focused on the task. And when someone suggested, you're a leader, he kind of bowed low. He was humble because of it. The very next chapter, Chapter 10, it's coronation day. He's going to be coronated king. They can't find him. And they finally find him hidden behind the equipment. He didn't even want to show up on coronation day. So he had a low view of himself. He has family, he has physique, and he has focus. And yet, he says, I've played the fool, and I have erred exceedingly. I have played the fool and erred exceedingly. Now, that's not all that he had going for him. He had those natural advantages, but now, just think for a moment, the supernatural advantages. What did he have supernaturally? Well, he had God's power. God promised this next king all of the spiritual power needed to execute the office of being king of his people. This is 1 Samuel 10:6. "Then the Spirit of the Lord will come upon you," the prophet says, "and you will be turned into another man." How is that for a promise? I'm going to make you a different person. And it goes on to say he had a new heart. He was given a whole new heart. So the Holy Spirit is all over this guy. He has God's power. He also has God's presence. In the very next verse of Chapter 10, I'm just reading this to you again, the prophet says, "God is with you." God is with you, Saul. Let me just tell you, when God is with you, don't need anything else. You've got it all. God is with you. Jesus said to his disciples, Lo, I am with you always, even to the end of the age. It's all you need. Go. It's all you need. So he has family, physique, focus. He's got God's power. He's got God's presence. And he has something else. He has God's people. We're told in Chapter 10, again, "Saul went home to Gibeah," and, listen to this, "valiant men went with him whose hearts God had touched." So besides God's power and God's presence, he has a staff of God's people. Soldiers. He has every advantage to be successful. And yet he says, I played the fool and erred exceedingly. 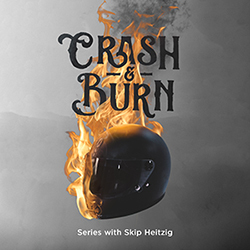 How does a person crash and burn with those advantages, naturally and supernaturally? I was reading an article this week by the Department of Transportation that said, the number one cause of accidents in America-- What you think it is? Running a red light. And I don't know if it's texting, somebody mentioned that. Could be that texting caused you to run the red light. I wouldn't doubt that, but that's a whole other sermon. Running red lights is the highest cause of accidents in America. And you know how much time you save if you run the red light, average? 45 to 50 seconds at the most. That's all you save. But the annual cost, the burden to our society, is $7 billion a year in damages. Just from people running red lights. Saul's whole life was running red lights. Let's look at a few. We've looked at how we began. Let's consider what went wrong. What were the snags? What would cause a man to be so remorseful at the end of his life? I ask that because it interests me. Some people start well, but they end poorly. When I first moved to this town, I met a man who had been a minister for years. I was fresh to the ministry. I was fresh to the area. And it was a shocking meeting, because he told me he used to be in the ministry, but because of moral indiscretion, some moral failure, he was not doing that any longer. And I'll never forget his words. He said, gone-- those were his words-- gone are the opportunities I once had. Gone is the joy of serving in the capacity I once enjoyed. And he said, Skip, the thing is, it didn't have to be this way. That made an impact on me. FB Meyer once said, this and I quote, "This is the bitterest of all, to know that suffering need not have been. That it has resulted from indiscretion and inconsistency. That it is the harvest of one's own sowing. That the vulture which feeds on the vitals is a nestling of one's own rearing. Ah me, this is pain." Close quote. Saul could have written that. Ah me, this is pain. So what red lights did Saul run? How did he play the fool? Well, first off, he played the fool by arrogance. He was a prideful man. I want you to look at one verse in Chapter 13. Remember, I said have that ready? 1 Samuel Chapter 13? Look at Verse 3. Gives you insight. "And Jonathan attacked the garrison of the Philistines that was in Geba, and the Philistines heard of it. Then Saul blew the trumpet throughout all the land, saying, 'Let the Hebrews hear.'" Now that verse doesn't sound like much, but let me tell you the whole chapter. King Saul, as the new king of the land, has a standing army of 3,000 soldiers. 2,000, he maintains. 1,000, he puts in the charge of his son, Jonathan. Jonathan attacks. Jonathan gets the victory. But Dad blows the trumpet. You see? He toots his own horn, literally. He takes the credit for it. And it just gives you a little bit of insight, right at the beginning, what kind of a man we are dealing with. It reminds me of the woodpecker I've told you before about, who is pecking, pecking, pecking at a dead tree, and a storm was brewing, and lightning came out of the sky and struck and splintered the tree, and that bird just barely got out alive, and went and joined all his friends, and then said, look what I did. That was Saul. Look what I did. Well, you didn't do it. Jonathan did. You're just taking the credit for it. Saul started out humble, but the more elevated he became, the greater he declined inwardly. And pride will do that. Pride will destroy everything. Pride destroys families, ministries, friendships, you name it. Get pride in there, and there will be destruction. Pride goes before destruction, the Bible tells us. Now, in the same chapter-- I don't have to look at it all. We don't have the time. Same chapter, Saul builds an altar after the battle and sacrifices an animal on the altar. What's wrong with that? Only priests can do that job. But he decides, I'm the King, I can do whatever I want. He sacrifices on it. Samuel shows up and said, what do you think you're doing? That's arrogance. That's what he's doing. A couple chapters later, Chapter 15, we're told Saul built himself a monument, a monument to himself in Carmel. So he thought he was so cool that he needed a statue, so people could check it out as they're going back and forth on the road. Pride is the only disease known to man that makes everyone sick except the person who has it. This boy was sick. He was running red lights. He was playing the fool by arrogance. Not only by arrogance-- let me give you a second red light-- Saul played the fool by indifference. Indifference. To explain that, I need you now to look at Chapter 14 of 1 Samuel. And before you jump into it, let me tell you what is happening. In Chapter 14, Jonathan, Saul's son, takes action. The enemies of the Philistines-- Listen to what Jonathan does. He had 1,000 men, but he's looking at his armor bearer. Just two dudes. He looks at one guy, his armor bearer, and he goes, you know, how about we do something crazy? Let's you and I go against the Garrison of the Philistines. Just you and I. Because maybe the Lord will give us the victory. And listen to his rationale. For what restrains the Lord from saving by many or by few? I mean, if it's the Lord, he can use 1,000, or 2,000, or 5,000 men. But he could also just use you and me. The armor bearer said, I'm game. They went in, and God miraculously gave them the victory. What Jonathan didn't know is that his dad, Saul, had given an order to his men, saying, no one can eat anything until after the war is over, and I have gained the victory on my enemies. And anyone who eats anything will be killed. Now, how stupid is that? How indifferent to the needs of a soldier is that? Soldiers need fuel before the battle. I mean, you can't eat anything until after the battle? That's like me telling my staff, nobody gets paid until we see 25 salvations. That's the quota. Well, Jonathan had not heard this curse his father put on. Look at Chapter 14, Verse 24. "And the men of Israel were distressed that day. For Saul had placed the people under oath, saying, 'Cursed is the man who eats any food until evening, before I have taken vengeance on my enemies.' So none of the people tasted food. Now all the people of Israel came to a forest, and there was honey on the ground. And when the people had come into the woods, there was the honey, dripping. But no one put his hand to his mouth, for the people feared the oath. But Jonathan had not heard his father's charge the people with the oath. Therefore, he stretched out the end of his rod that was in his hand, dipped it into the honeycomb, and put his hand to his mouth. And his countenance brightened." Sugar will always do that. "Then one of the people said, 'Your father strictly charged the people with an oath saying, cursed is the man who eats food this day.' And the people were faint." See what indifference does? It makes the army faint. "But Jonathan said, 'My father has troubled the land. Now look how my countenance has brightened because I tasted a little of this honey. How much better if the people had eaten freely today of the spoil of their enemies, which they found? For now, would there not have been a much greater slaughter among the Philistines?'" Not only does this happen-- When Saul finds out that his son, Jonathan, has eaten something, you know what he says? Oh, well, we have to kill my son now. Now, again, Jonathan wasn't there to hear the order. It was a lame order anyway. But because this guy is so stubborn and indifferent to the needs of his soldiers, he goes, oh, well, even though my son brought us the victory, we got to kill him, because I said it. That's when his men stepped in and said, not going to happen. And they started losing respect at that point for him. Loyalty began to wane right then. Now here's what he could have done. Rather than intimidating his men, he could have inspired his men. You inspire people by things like Nehemiah. Nehemiah was building a wall. And it says, "for the people had a mind to work." I love that phrase. "The people had a mind to work." And they got a mind to work because their leader, Nehemiah, fostered that, encouraged that, exemplified that. Saul just intimidated them. And this is why Saul never really developed loyalty among Israel, because he was indifferent. A fool will be indifferent, oblivious to the needs of others around him or her. So he plays the fool by arrogance, by indifference. There is a third red light that he ran. He played the fool by disobedience. Now, after Chapter 14 is Chapter-- 15, thank you. I hope you're there, Chapter 15. Again, I'm just sort of telling you the broad story and having you look at snippets of it. In Chapter 15, there's a whole new enemy called the Amalekites, bad dudes. They surface once again. And the king, King Saul, was told by the prophet Samuel to eliminate them. He doesn't do that. Now his arrogance that has birthed his indifference now leads to disobedience. Disobedience is always the fruit of pride. Disobedience is always the fruit of pride. When a person begins to inflate and think that they're really important, they start making their own rules up. They start writing their own rulebook. So this king, King Saul, spares the enemy king, Agag, and spares some of the animals that were taken, keeps them for himself. And when he does that, he even uses spiritual words to cover up his disobedience, God talk. Praise the Lord, brother. But he doesn't really mean it. I want you to see it. This is Chapter 15, Verse 13. "Then Samuel went to Saul, and Saul said to him," this is Saul coming fresh off the battlefield, "'Blessed are you of the Lord. I have performed the commandment of the Lord."" Doesn't that sound good? Praise God, Sam. Good to see you. This is the guy who says, praise the Lord, while putting the knife in your back. It's just cover up talk, God talk. "But Samuel said, 'What then is this bleating of the sheep in my ears, and the lowing of the oxen which I hear?'" If you obey God, why do I hear animals still? "And Saul said, 'They--'" he's pointing to the people now-- "'They brought them from the Amalekites. For the people spared the best of the sheep and the oxen, to sacrifice to the Lord your God. And the rest, we have utterly destroyed.'" Boy, you can make a lot of excuses when you pull up spiritual reasons to do so. "And Samuel said to Saul, 'Be quiet.'" I like this guy. "'Be quiet. I will tell you what the Lord said to me last night.'" He goes on to say, God is taking the kingdom away from you. Now you've got a king flatly disobeying, and making excuses while he's doing it. Billy Sunday, the evangelist, said an excuse-- listen to this-- an excuse is the skin of a reason stuffed with a lie. Isn't that a great description? It's the skin of a reason stuffed with a lie. Paul Eldridge wrote, "We hate the hypocrite more keenly than the mere liar, because hypocrites add to the lie with the lacquer of flattery." This is a lacquer of spirituality. And he likes to blame lots of other people. In Chapter 13, after he made that sacrifice that he shouldn't have made, he blamed Samuel for being late. In Chapter 14, that oath that he made against his men, he blames Jonathan. And now he blames the people. He's blame-shifting. Never takes personal responsibility. It's Always somebody else's fault. He played the fool by disobedience. Let me show you a fourth and final way he did it. He played the fool by preeminence, by preeminence. He always wanted to be the guy that people looked up to as the best. That's where his pride leads, now to preeminence. He can't stand it if somebody gets the attention. OK, now look at Chapter 18 for just a moment, and as you're turning there, let me tell you what you are skipping. In between what we just read in Chapter 15 and Chapter 18, there's a notable battle, a little shepherd boy named David against a big dude named Goliath. That happens in Chapter 17, David and Goliath. This little shepherd kid has guts, faith, goes up against Goliath, beats him. Now let's look at Chapter 18, Verse 5. "So David went out wherever Saul sent him and behaved wisely. And Saul set him over the men of war, and he was accepted in the sight of all the people and also in the sight of Saul's servants. Now what happened is they were coming home when David was returning from the slaughter of the Philistine, that the women had come out of all the cities of Israel singing and dancing to meet King Saul, with tambourines, with joy, and with musical instruments." And you got to know that Saul was super stoked when the chicks were coming out and singing about him. What he didn't count on were the lyrics to the song they were singing. It was a popular song. It was on the top 40 list. It was number one in the country. It says, Verse 7, "The woman sang as they danced, and said, 'Saul has slain his thousands, and David his ten-thousands.'" Didn't like the lyrics of that song. David has now been launched-- because he defeated Goliath, he's launched into celebrity status, higher than Saul. Let's look at his reaction. "Then Saul was very angry, and the saying displeased him. And he said, 'They have ascribed to David ten-thousands, and to me they have ascribed only thousands.'" I have to do in that pouty voice because it's like pouty-boy king. "'Now what more can he have but the kingdom?' So Saul eyed David from that day forward." Now you have a King who's jealous of a shepherd boy. And jealousy always blows everything out of proportion and will create irrational behavior. When you're jealous at a person, you always look at the Instagram post or the Twitter feed, and you read stuff into it, and you're angry with what you see. That's what jealousy does. It blows things out of proportion and it creates irrational behavior. Saul will ask for David, later on, to come and play his music before him, because he's so distressed and so depressed. And he needs David, because David is skillful, and he needs his personal iPod there to kind of give him a concert. So David plays for him and soothes Saul, and he feels better, but then he looks up at David, and that jealousy monster starts creeping up. And he decides, I'm going to play pin the spear on the musician. Grabs his spear and throws it at David. Irrational behavior. Did you know that fishermen who fish for crabs will tell you that they never need a top to their crab basket? They'll go down and they'll get a whole basket full of crabs, and crabs can crawl out of things. But crab fishermen say, I never need to put a lid on it. You know why? They say, whenever one crab starts to crawl out of the basket, another crab will grab it and bring it down. Isn't that amazing? So there's a crab saying, I got to get out of here. And the other guy goes, no you don't. Then he goes, I've got to get out of here. And the other guy goes, no you don't. They always pull each other down. Some people are a lot like crabs-- crabby people-- jealous of others. Let me pull you down to my low level, because I always have to have the preeminent-- That is foolish. He played the fool that way. So those are the areas he did it in. That's how he began. That's what went wrong. Let me end on this note. What should have changed? Is there anything Saul could have done to stop from ending up by saying, I have played the fool and erred exceedingly? Yes there is. Let me suggest a few things. Number one, he should have lived before his God. Now, that's not just God talk. Listen to that. He should have lived before his God. Saul mentions God. He acknowledges God. He even praises God. But there is never evidence in his life that he allowed God to rule in his life. He never lived in the conscious awareness of the presence of God. There's a phrase in the Bible, used 27 times. It's called the fear of the Lord. I wish it was brought back into more churches and talked about in more settings these days. The fear of the Lord is a good phrase. It doesn't mean I think God's going to zap me. It's the idea that I am living in the ongoing reality that God is always listening, always looking, always seeing what I am doing, and hearing what I am doing, and thinking, it's important to me, and I fear that I might somehow displease God. That's a healthy reverence or fear of the Lord. Saul didn't have that. The biggest blasphemy is not a person who shakes his fist at God and says, I don't believe in God. The biggest blasphemy is a person who says, I believe in God, but then lives as though God didn't exist. That's called being a practical atheist. It's worse than a philosophical atheist. Some people just say, I don't believe in God, and they live like that. Other people say, I believe in God. He's important to me. But they live their lives through the week as though God didn't exist. Saul should have lived before his God. Second thing he should have done, Saul should have learned from his past. Twice in this book, he utters the sentence, I have sinned. But never does he do anything about it. Never is there a change in his behavior, there's never a real self assessment that would enable him, by God's grace, to make a turn, a change. You can't change your past, but you can learn from it. He should have done that. A third thing you should have done. He should have leaned on his friends. I mentioned this, I think, last week with Samson. It's a pattern we see with people who crash and burn. They neglect good friends. He should have leaned on his friends. Ever thought about who is available to be his friend? Samuel would have been a good start. Samuel was a prophet who got in his grill and would be honest with him. He was a man of God who pursued God, and it would have been of great benefit for Samuel to be a friend of Saul. Wouldn't have anything to do with it. He could have cultivated a friendship with David. I know David was a shepherd boy, musician, maybe a little flighty, but a man after God's own heart, and a great one to have as a close friend. Jay Oswald Sanders said, you can tell the stature of a leader by the quality of his friends. So he should have done those things. Let me give you a fourth and final thing he should have done. Saul should have looked after his character. You know what Saul looked after? Not his character, but his reputation. What was more important to Saul is how he looked to other people on the outside, rather than who he really was on the inside. Reputation was important. Character should have been important. And so he said, indeed, I have to played the fool. Indeed you have. Didn't have to, but you did, and this is how you ended up. I have played the fool and erred exceedingly. Once upon a time, there was a king who loved to laugh. And while being entertained by his court one day, a jester was coming through town and decided to join the festivities. And he put on a show for the king. It was the best show the king ever saw. The king never laughed so hard in his life. And afterwards, he said to the jester, I want you to be my personal court jester. You make me laugh. You are the funniest guy in the world. And then the king, just laughing like a giddy child, picked up a little stick and gave it to the jester, and said, I'm giving you this stick because you're the biggest fool I ever met. Ha, ha, ha, ha! Gave him the stick, and he said, now, if you ever meet a fool bigger than yourself, give him this stick. Well, years went by. And at the end of the king's life, he was on his deathbed, and he called for the jester one last time, needed one final laugh. The jester came, put on a wonderful show for him. The King laughed and laughed. And the jester leaned in and said, king, where are you going? The king said, on a far journey. And how will you get there, king? King said, I don't really know how I'll get there. And what will you do when you get there? He goes, I don't know. The jester pulled out of his pocket the little stick and handed it back to the king. And he said, I'm giving you this stick because you're the biggest fool I've ever met. For, king, you see, I have only trifled with the things of this life, but you have trifled with the things of eternity. You see, the biggest fool is someone who provides for this life but makes no preparation for the next. And if you are somebody who has provided only for this life and have made no preparations for the next, then your line is, indeed, I have played the fool and erred exceedingly. But it doesn't have to be that way. It should be different. And it can be different. And it can start right here, right now, before God, in this place with God's people. Let's bow for a word of prayer. Father, thank you that the Bible is honest about its heroes, its characters. It shows us the paths of those who have failed, as well as the paths of those who are wise and have not failed-- who finished strong, finished well. Thank you that both are laid out side by side so that anyone can read, contemplate, and make a decision. Truth is, we all make decisions about our lives every day, some good, some bad. But here is a choice that would mark us as either a wise man or woman, or else a foolish man or woman. I think of that statement made by Moses, I set before you this day life and death. Therefore, choose life. Choose life. Choose life. I pray that we would choose life, eternal life, a life of wisdom and not foolishness. Father, for those who are here in the throes of making an eternal decision, maybe they've been thinking about that for some time, but it's come to a head, and they're confronted with yet another example of somebody who didn't do it right, and they're reading this, they're thinking about this, they're thinking, I don't want to end up like that, I don't want to be that guy-- I want the end to be good. No matter how you have begun, or whatever you've experienced in the middle, you can end well. And the place to start, the place of wisdom, is to simply, humbly-- like Saul once was-- humbly acknowledge you need God's help. Acknowledge you're not a perfect person, that you've done wrong things, thought wrong things. The Bible calls it sin. When you acknowledge, I've sinned and I want forgiveness for that, that's where it [? began. ?] That's wisdom. Because that causes you, then, to look for help. And you look, and there's God, who offers you salvation, offers you help, offers you forgiveness, and offers you power to overcome, and to walk with you through life, giving you His power, and His presence, and His people. He'll give you the resources needed. But you have to be humble enough and willing enough to say, I need Him. I want Him. And you turn to Him. And if you are willing to do that-- as our heads are bowed, as our eyes are closed-- I'm going to leave mine open so I can acknowledge you and pray for you-- I want you to raise your hand up if you're saying, I want God's help. I want to be saved. I want to know that when I die, I'm going to heaven. I want a do-over. Whether you have never done this before or you need to come back to the Lord, I want you just raise your hand up in the air right now, so I can see it. And I'll acknowledge you. Keep it up for just a moment, please. God bless you in the front, and in the middle. Couple of your hands there. Anyone else, raise those hands, please. Right there, yes ma'am, in the middle. Right over here to my right. Raise it up, all the way up, an act of humility and submission. God bless you and you, and in the balcony. A couple of you up there. Anyone in the family room, bless you. Thank you. Right over here to my left, in the front. Thank you, father. Lord, I do pray for these-- these are precious lives. You created each one. You have a plan for each one. Each person is unique. And you love them so much that you prepared and provided a way, through the death of your son, that they might have life. And we honor them in this decision. Please strengthen them for your sake, your glory. In your name, Amen. Would you please stand to your feet? As we sing this final song, as we often do, we do it because we see a pattern in the Bible where Jesus calls people publicly. I want to give you an opportunity, publicly, to say yes to him. This is an important step. You're going to find a great release when you do this. We're going to be cheering for you as, if you raised your hand, you get up now out of your seat, and find the nearest aisle, and stand right up here. And I'm going to lead you in a word of prayer to receive Christ. If you're in the balcony and you raised your hand, if you please come down the balcony steps and find that aisle. If you're in the family room, please come from the family room through the door and right into the main auditorium. If you're in the back, if you're in the middle of a row, just say excuse me. We're used to this. We want to celebrate this with you. I saw hands go up around the auditorium. I'm going to wait for you to come. You definitely come. Yeah. Awesome! Please come on, all the way up. We'll wait for you, but come on down. --was bought with the precious blood of Jesus Christ. This is a good thing to do at church. It's good to get you involved. And if you're saying yes to Jesus Christ, then jump in all the way. Just abandon yourself to the care of God. And God's people around you are celebrating that. Please don't think, well, I raised my hand, they were saying a little prayer for me, and I can go-- No, come on, man. Step out of the shadows. Come and enjoy what God has for you. We're going to sing this through another time. God's calling you, prompting you, you come and join. Come on all the way up. Awesome. Come on over. I'm going to pray with these fine folks right here. So if you have come forward, don't know your background. Don't know what you've done. But you don't know what I've done either. And I'm just telling you, we're all in the same boat. We stand before a holy God who says, I'll forgive you. I'll forgive you. I'll give you, not only a chance, but I'll give you a life. I'll help you. I'll walk with you in a life, a different life than you've known before. I'm going to lead you in a prayer. I'm going to ask you to pray out loud, say these words after me. Say them from your heart. Say them to the Lord. Let's pray. Say Lord, I give you my life. Say that. --that he rose from the dead. Help me follow him as Lord. Even leaders crash and burn, but we all have the choice to change when things go wrong. How will you apply the truths you learned in this message to your life? We want to know. Email mystory@calvaryabq.org. And just a reminder, you can give financially to this work at calvaryabq.org/give. Thank you for joining us for this teaching from Skip Heitzig of Calvary Albuquerque.